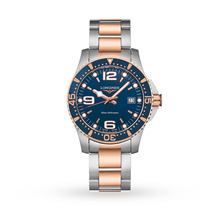 Introducing the stunning Longines Hydroconquest bracelet watch, the perfect timepiece for exploring the ocean. The expert Swiss craftsmanship is showcased in stainless steel featuring suave gold tone detailing and scratch resistant sapphire crystal glass. The round blue dial is complete with date window, luminescence and bold hour markers for an easy read at depths. An impressive prestigious timepiece suitable for all occasions.